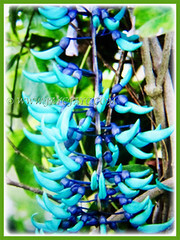 The Jade Vine or Emerald Creeper is an exotic and magnificent tropical plant with pendant-like clusters of iridescent blue-green blooms. 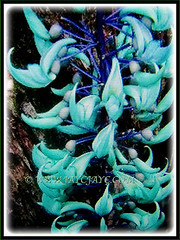 The colour of its claw-like flowers is absolutely stunning and unique. These colours are rarely seen in other flowering plants. Botanical Name: Strongylodon macrobotrys (syn. : Strongylodon megaphyllus, Strongylodon warbugii). 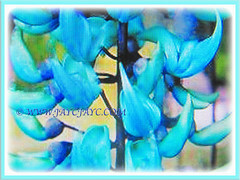 Common Names: Jade Vine, Emerald Vine, Emerald Creeper, Turquoise Jade Vine. Etymology: The genus Strongylodon is from the Greek words strongyl, meaning round and odens, meaning tooth. The specific epithet macrobotrys is also from the Greek words macros meaning long/large and botrys meaning cluster, referring to its long and large cluster of flowers. Origin: Native to the Philippines. It is popularly cultivated worldwide. Plant type: An ornamental and tropical climber. Features: Strongylodon macrobotrys is from the genus, Strongylodon that consists of about 20 species of flowering plants. 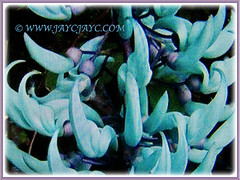 An aggressive grower, the Jade Vine is a strong stemmed, woody and twining creeper which can grow up to 18 m in length. The vine will be covered with dense and glossy pale green leaves, up to 25 cm long and consists of three leaflets. Only mature vine produces inflorescences. The vining trunk needs to reach about 1.5 cm in diameter before blooming can begin. 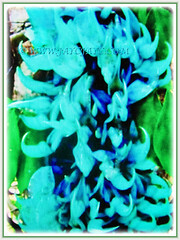 The claw-shaped flowers have a unique turquoise or translucent jade-green colour. They are carried in cascading trusses of 75 or more flowers and can reach as much as 3 m in length. 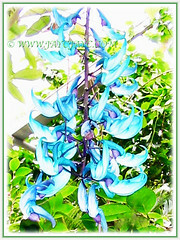 The dangling large clusters are suspended from twisting, wisteria-like stems. The flowers will be followed by short, oblong and fleshy seedpods. 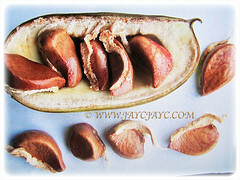 They are up to 15 cm long and contain up to twelve seeds in each pod. 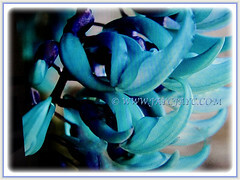 Culture (Care): Strongylodon macrobotrys or Turquoise Jade Vine can be easily grown with minimum care. Light: Best in full sun or bright filtered sunlight for optimum growth and flowering. Moisture: Moderate water requirements. Water only when the top soil is visibly dry. It likes a humid environment. Soil: Best in humus-enriched, loamy and well-drained soils. Nevertheless, it adapts well to any commercial potting medium, provided it’s well-draining. 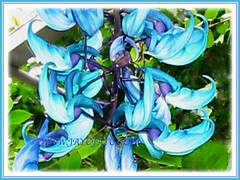 Others: Trim the Jade Vine after blooming. Since the plant blooms on both old and new growth, do not hard prune as it will delay blooming. Lack of water may cause leaf browning and stunted growth. Feed once fortnightly with a balanced fertilizer for flowering plants at ½ strength. Generally free from serious pests and disease problems. However, do watch out for mealybugs, aphids and spider mites. Strongylodon macrobotrys is not frost tolerant. In colder latitudes the plant must be grown in a large greenhouse or conservatory with proper growing conditions. In cultivation the plant flowers in early spring. It needs a minimum temperature of 15 °C as lower temps may damage its roots. Feed the plant once fortnightly with a balanced flowering fertilizer in spring and summer but withhold during fall and winter. Propagation: Can be propagated from stem tip cuttings, marcotting or by seeds that are harvested from its seedpods. 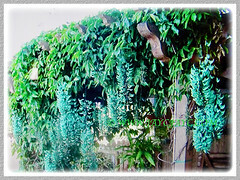 Usage: Strongylodon macrobotrys or Jade Vine will be excellent over a pergola or other tall support to display the spectacular cascading flower trusses. Suitable to be grown in a large container though best suited for ground planting to enjoy its long, pendulous and iridescent blue-green clusters of exotic flowers.